Smaller communities, even individual neighborhoods, coming together to take on environmental issues can create a big change. Lowering the carbon footprint not only of your own home, but encouraging others around you to do the same, can be impactful. One approachable way to lower your carbon footprint is by improving your daily commute. There are many ways to green your commute and get to the places you need to be in a sustainable, environmentally friendly way. Read on to learn whether your commute has room for improvement, the benefits of changing how you get around, and how you can green your commute and engage others in your neighborhood or community to get involved. What Makes a Sustainable Commute? Walking, biking, carpooling/ridesharing, and taking public transportation to commute to work are all viable, sustainable transportation options. A sustainable commute should be easy for you and others to maintain throughout the year. Simply taking advantage of incentives that are offered during “bike to work week” or other short-lived programs won’t have the long-term effects that benefit both your personal and environmental health. If you live a considerable distance from your place of employment or school, walking as a means of commuting is likely unsustainable — although your intentions may be good. Likewise, if you live somewhere with distinct seasons, not all alternative commute options will be available all year-round — although greening your commute for part of the year is better than not at all. Conduct some research about the public transit available in your area. Many forms of public transportation (such as buses and subways) are evolving to utilize electric or hydrogen engines and lower their emissions. Public transit is also less likely to be weather-dependent or seasonal, giving you a year-round alternative to driving yourself. Green commuters are an important counterforce to driving trends around the world. According to a 2016 U.S. News & World Report, 76.3 percent of Americans still commute to work alone in their cars. This is catching on elsewhere: as more developing countries and cities around the world buy and drive cars, the total number of vehicles in use on the planet is projected to nearly double by 2035. Rather than utilizing a car share service, taxis, buses, or active travel (biking, walking, etc) commuters often prefer to travel by themselves in their personal automobiles. Since green commuting is an alternative to driving, the benefits of making the switch start with diminishing the hazards of traffic, but can be as far reaching as impacting property values and improving quality of life. Whether it is to school, work, or even your weekly grocery store run, every time you get into your car you are burning fossil fuels. This way of commuting to work has caused (and is continuing to cause) a steep increase in air pollution and traffic congestion. Traffic congestion in certain areas can be more prevalent and obvious to the public eye. Additionally, slower moving traffic emits more pollutants to our air than traffic that is moving at freeway speeds. According to the Transportation Research Board, while you are stuck in these traffic jams, you are breathing in elevated levels of carbon monoxide, volatile organic compounds (VOCs), hydrocarbons (HCs), nitrogen oxides (NOx) and particulate matter that is being exhausted into our atmosphere by you and your neighbor’s tailpipes. A sustainable commute is not only beneficial to lowering your environmental impact — it can also have incredible health benefits. By introducing active green commuting to your work days, you can reduce your risk of medical conditions associated with sedentary lifestyles. Biking or walking to work can reduce your risk of heart disease, type 2 diabetes, obesity and other associated diseases. Similarly, any driver that has a long commute can attest to what a source of discomfort sitting in traffic can be. It can cause people to be become irate (or in extreme cases, experience road rage), which can contribute to stress. Chronic stress will eventually take its toll on your body. Adding passengers to form a carpool or avoiding the roads entirely through alternative transportation can insulate you from this emotionally and physically toxic environment. Best of all, changing your own habits can help other people change theirs. The more visible green commuters become, the more normal their choices appear to be. Instigating a green commuting initiative in your community will help to establish a baseline for a healthy neighborhood and lifestyle. 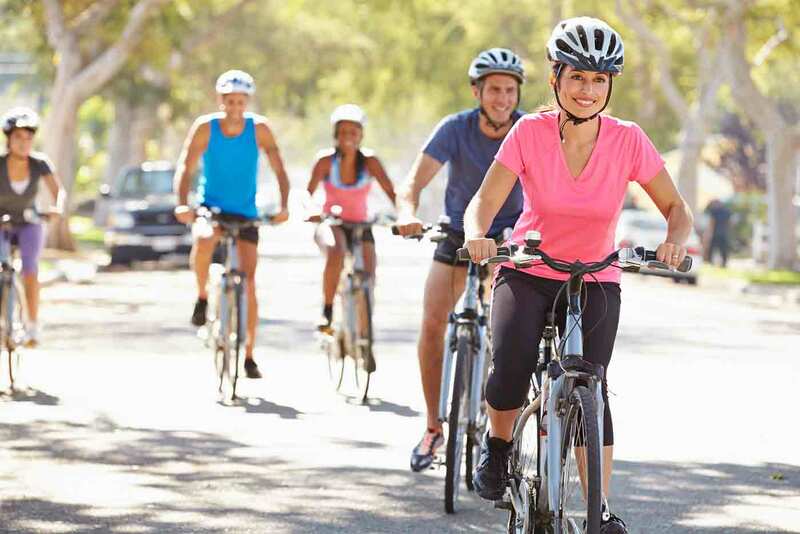 When working with your neighbors to create a sustainable commuting option, make sure to mention that proximity to walking and biking trails or public transportation increases the value of homes throughout the entire neighborhood. A George Washington University School of Business study found that a growing share of both residents and businesses prefer locations near walkable and/or bikeable trails, and that access to alternative transportation is becoming a priority for future development. This should be of interest to both buyers and sellers that may benefit from being near greener commuting options. Increasing the value of your home might be what sells your neighbor on volunteering to do local trail maintenance, or what encourages them to vote for the establishment of new bike lanes and public transit routes near your community. What’s more, low-cost transportation options can help balance household budgets by saving on auto maintenance and fuel costs. Take the initiative to start organizing a green commuting group and promoting a healthy neighborhood. You can get started by posting signs on local message boards to gain interest in learning more about sustainable commuting options. Starting a group on a social media platform, such as Facebook, can help to attract those of the millennial generation to your cause. Are there established bike lanes? Do you have access to public transit within walking distance? Are there maintained trails and sidewalks? Is there a car or bike share available in your area? Who is interested in doing a rideshare? When you’ve determined what your neighborhood is missing, start building task forces to create changes in your area. By identifying some of the strengths of your neighbors, you can further understand how to best utilize them. Perhaps someone that lives down the street works for the city and would be interested in developing a group that petitions for wider and better bike lanes. If multiple employees of a large local company are located within close proximity to one another, that company may be persuaded to donate funding to establish new public transportation routes near their employees homes. Once bike lanes and walking trails are established, they will provide you with means of travel for years to come, as well as increase the value of your home. Sustainability is becoming a priority for individuals, businesses, and governments around the world. Development and financial investment is increasingly tethered to accessible green spaces, and healthier modes of transportation. Fortunately, changing up your commute and getting involved in making your community more walkable, bikeable, and healthier isn’t impossible, even for the individual. By investing in the health of your neighborhood through establishing sustainable commuting methods, you are making an investment in your home and your future.